Forget about paying the valet or circling for a good parking spot. When you’re on a bike you’ve always got VIP parking. Feeling up for the challenge, just not sure where to start? Take our advice. Do it – in the spirit of adventure. And share your photos, experiences, and favorite route tips with us too. 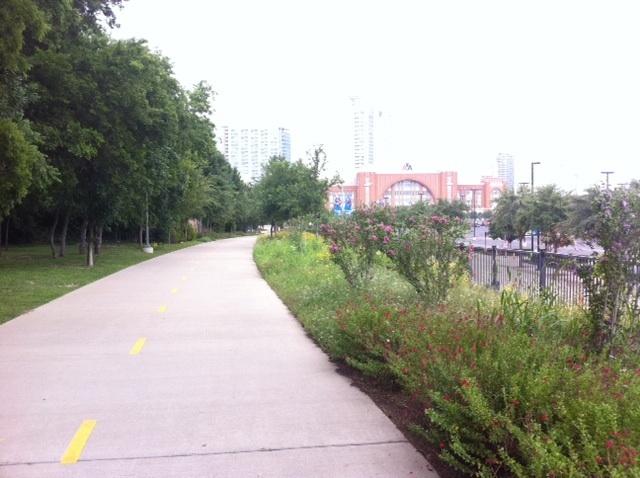 The Katy Trail goes through one of the most beautiful parts of town. It’s wide, tree-shaded, and full of natural beauty, including fit young people running, walking, and biking everywhere. It’s not a bike superhighway so ride at a safe speed and beware of strollers and people exercising with headphones, unaware of the world around them. It helps to call out “passing on your left” when approaching people from behind. 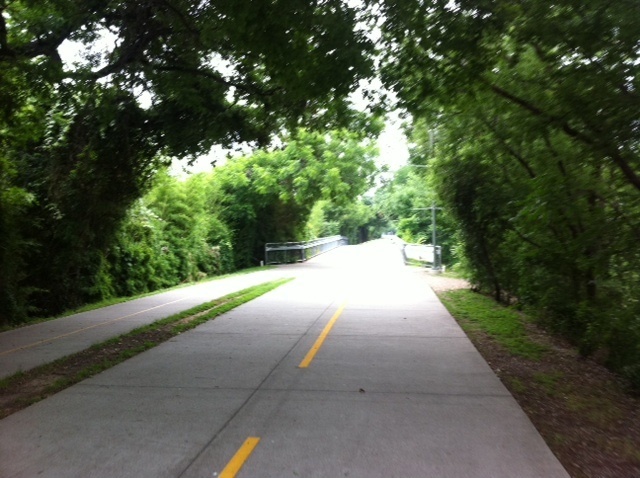 Once you’re on the Katy Trail, there’s a good bike friendly exit to the McKinney Ave/Lemmon Ave area. 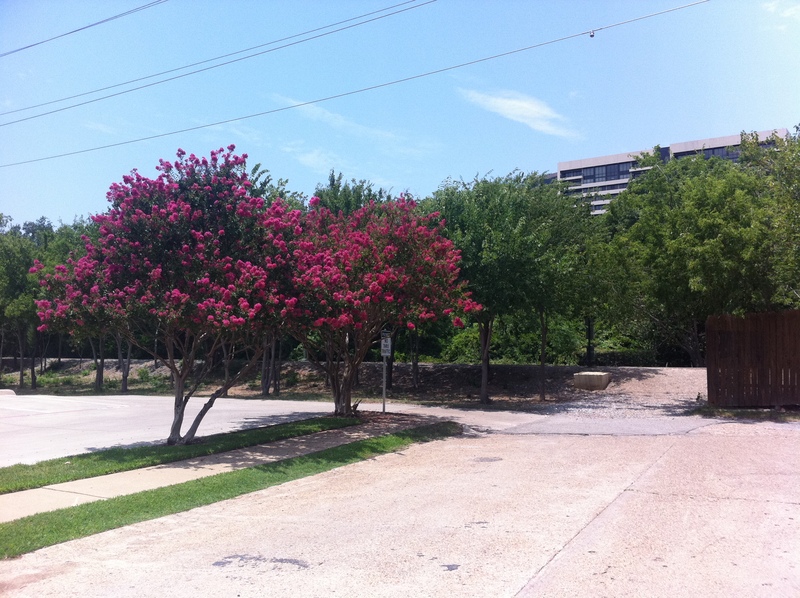 You’ll ride into a big plaza on the trail and to your right you’ll see where to hop on Carlisle St. From Carlisle you can get to McKinney Ave by way of Lemmon Ave (just to the north of Carlisle) or Hall (just to the south). If you’re headed to the West Village, there’s a good dirt sloped exit from the Katy onto Cambrick St (see picture below.) From there, the West Village is a block south (to your right) on Cole. 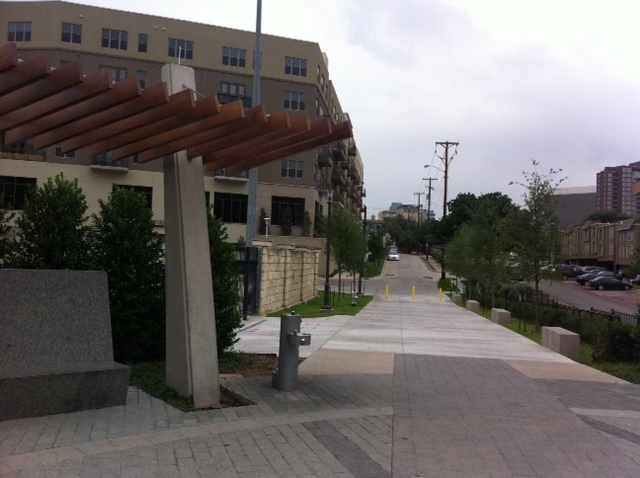 A bit further north is the trail’s intersection with Knox St. If you’re headed across 75 to Henderson or Greenville – and feeling brave – you can battle the traffic on Knox/Henderson straight to your destination. 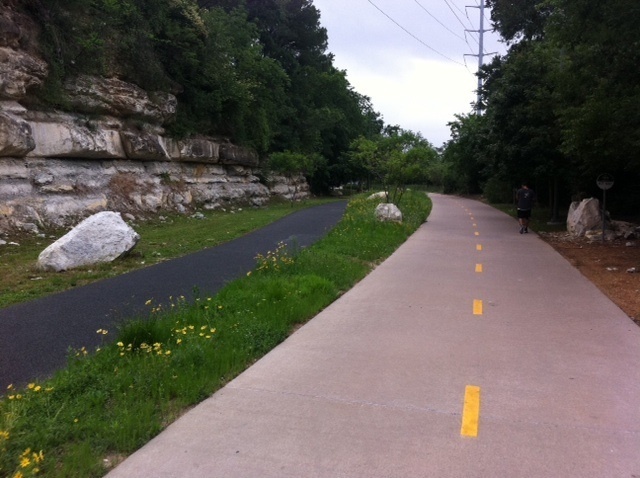 If you’d rather bike the road less traveled, continue up the Katy Trail to Harvard Ave. Hook a right down Cole and take your first left onto Monticello. That’s a calmer street to ride across the highway. 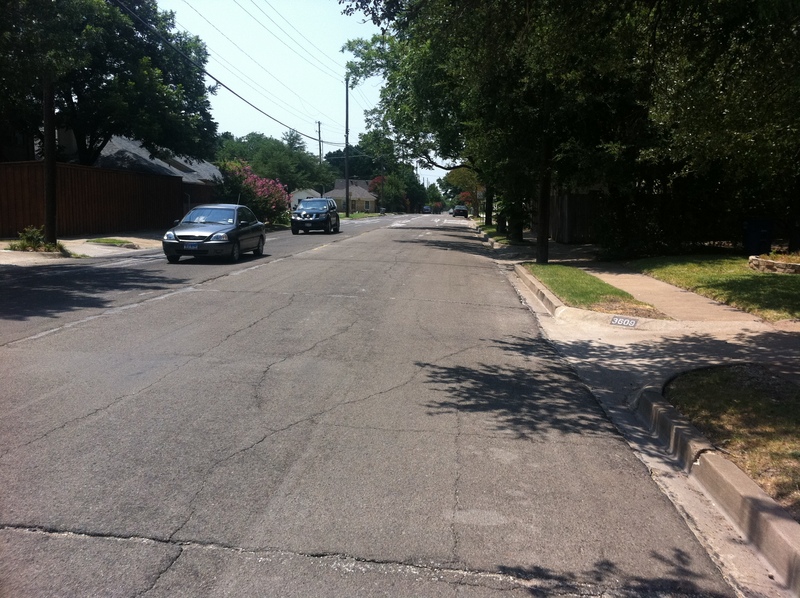 Once across, you’ll encounter numerous neighborhood streets leading down to Henderson, depending on where you’re headed. McCommas is another good road to cross 75, though it’s a bit far north if you’re headed to Henderson. It gets you very near to the Mockingbird DART Rail Station, and McCommas leads you straight to Greenville Ave, with the Granada Theater just to your left. If you’re taking the DART to the West Village, take the CityPlace exit – it’s under ground and you’ll have to take 3 elevators to get up. It’s fun – the signage is clear. Take the West exit and you’ll come up without having to cross 75. The street you’ll be on is Cityplace West – take it west just a block to the West Village. 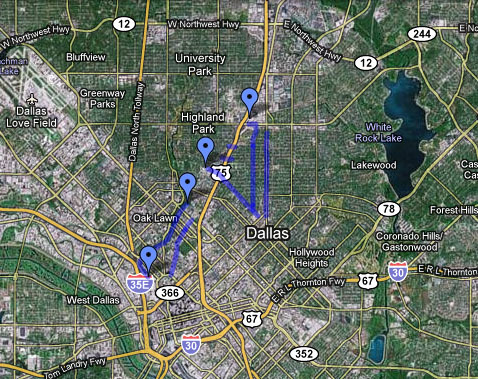 If taking the DART rail to Henderson I suggest getting off at Mockingbird. It’s a straight shot, downhill, on McMilan – a pretty chill wide neighborhood road. And if your headed to Greenville, there are tons of little streets going from McMilan Ave east to Greenville Ave. It’s such a pleasant ride and an easy straight shot, it makes me want to bike to dinner on Greenville more often. The tricky part about taking the DART train to your nighttime entertainment destination is that the trains stop running at midnight. So if you’re planning a long night out, plan your return trip sans train.